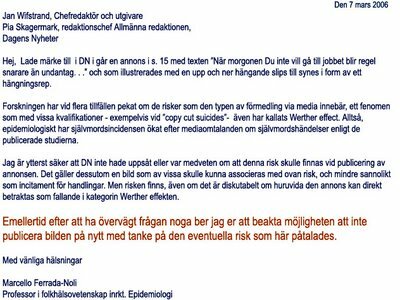 Professors blogg: Dagens Nyheter's “suicide advertisement” made in disregard of potential increasing of fatalities. 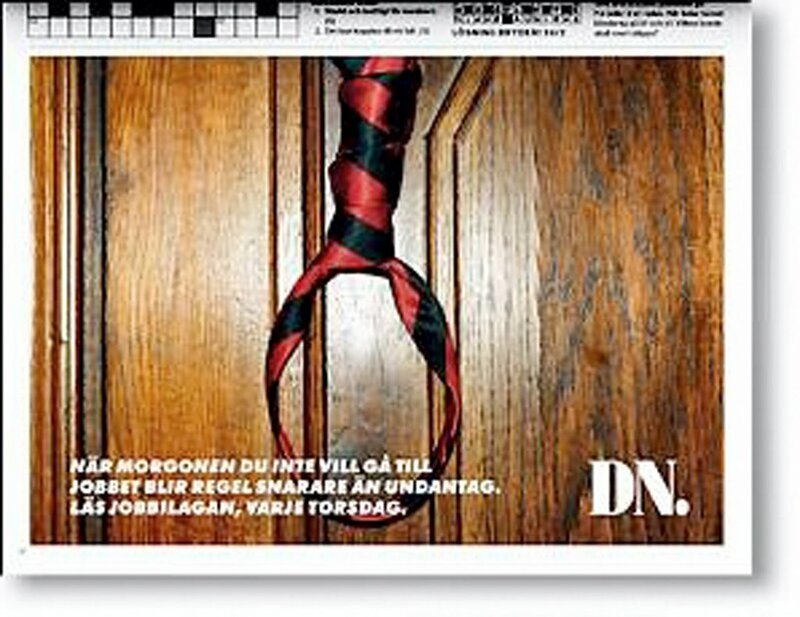 Dagens Nyheter's “suicide advertisement” made in disregard of potential increasing of fatalities. Besides, flirting with such risks - for the sake of commercial advertising- might become a risk in it self. Negative reactions of ethics-minded advertisers and readers may probe to exceed expected profits for sexig advertising. So, Dagens Nyheter responsible editors have decided to republish the criticized poster wich may be interpreted as containing - according to several I have interviewed - a hidden appeal for suicidal behaviour [see the blog next below or here]. This is made after a communication that DN has received, warning on further possible risks of an increasing of suicidal behaviour due to the republication of such ad. The publication anew of the ad was made as illustration of an article by Lilian Öhrström, published in both the printed and web editions of the newspaper, on March the 1oth (see picture above). The particular is that Lilian Öhström, DN's own läsarombudsmannen, is also critical towards the publication of the ad. According to DN läsarombudsmannen, the criticism to this publication that had arise among DN readers, apparently it focused on the "unpleasant associations" the advertisement evokes. Dagens Nyheter does not mention in that context the serious warning they have received - based on internationally published scientific suicide research - on the eventual risk for increasing fatalities related to that ad publication. That appeal was expressly delivered by me to the DN editors on March the 8th (see box further down). 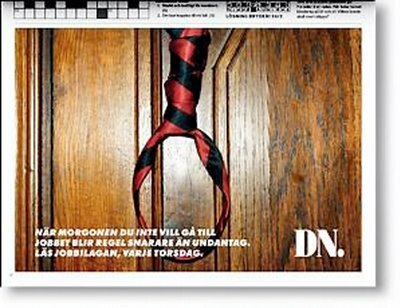 My contention is that there is a risk that such suicide-related imagery (like the full page ad - depicting a tie as if were a hanging rope) when published by main media, such as in this case the most important Swedish newspaper, may act as a trigger for underlying suicidal behaviour among indivuduals already at risk. Well, on the other hand, someone can argue, among all the national groups in Sweden, those exhibiting significantly higher suicide incidences are not the Swedes, but the foreign-born immigrants. This fact should be know by Dagens Nyheter since they have previously published a full-page article in DN Debate - authored by myself - focusing in the phenomenon of such overrepresentation of immigrants in the Swedish suicide statistics. Further, it is also known that foreign-born immigrants are overrepresented in the statistics for unemployment or labour mobility and expectancy. It is of outmost relevance to have the above in mind when analysing the publicly declaration made yesterday by Jan Wifstrand, DN’s chief editor in which he said, defending the publication of the ad: “The advertisement shall be interpreted bildligt (picture-wise). 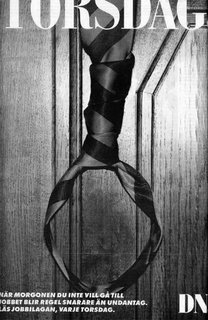 If one uses the expressions that it feels as a rope around the neck it does not mean that some one shall commit suicide. An advertisement shall call for attention and reflection”, said Jan Wifstrand (DN 10/3/06) "
So, what is specifically the attention/reflection DN wants to call for in the ad? And, what are your options if your are unemployed, or stack in your depressive job, or with none chances of getting a new job or a job at all? In other words, if you most likely are a bloody immigrant? According to DN's instructions on that "of course the advertisement shall be interpreted bildligt (picture-wise)" . So, one option would be to rush and buy Thursday edition of DN, in order to catch with their expensive job-ads allocated in the paper. But if you are an immigrant who have tried hundreds of times to get a new job, or a job at all, your possibilities of changing your situation are statistically very small. Another option DN offers you in the ad (you are supossed to "interpret picture-wise") is to go and use the hanging tie in the fashion depicted in the add, as seen in the picture to the rigth. Some of my students, by the way, even “saw” the half of a funeral coffin at the right of the picture’s background. Only during the last decade over 230 scientific articles have been published internationally on such relashionships between suicides and the media (indexed by Medline). That is why I had written a letter to DN editors - which receipt they opted for not to acknowledge. And now, through their insistence in publishing the poster in spite of being fully aware of such warning on possible fatal risks, DN clearly gives the impression that they do not care of such possible consequences. Dagens Nyheter can certainly exercise their right to ignore proven scientific knowledge whenever they wish, like in this case when that knowledge apparently goes against a rigid advertising policy. If not just a simple square case of Swedish-authoritarian "prestige" behaviour: Never publicly recognise being wrong. But by doing this, DN shows not only lack of empathy towards an important cohort of human misery, but also an absurd ostrich standpoint. 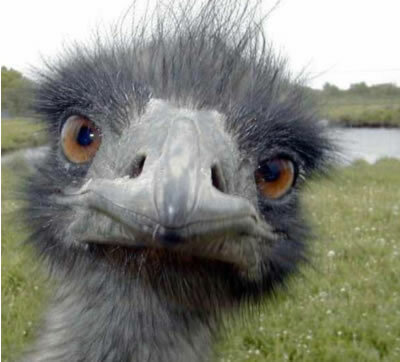 Namely, ignoring a scientific research does not eliminate the scientific findings they refer to. Facts remain.